Thu, Jul 5, 2018, 12:44 pm SL Time, ColomboPage News Desk, Sri Lanka. 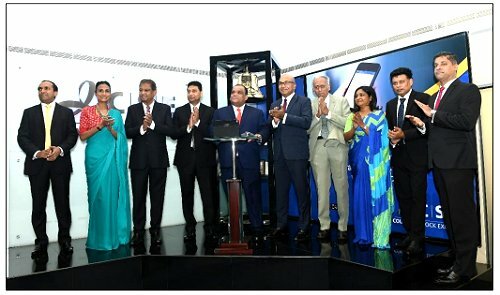 July 05, Colombo: Vallibel One PLC rang the opening bell to commence trading at the Colombo Stock Exchange (CSE) on Wednesday, as part of a ceremony organized to mark the company's inclusion in the S&P SL 20 Index. The S&P SL 20 Index includes the 20 largest companies, by total market capitalization, listed on the CSE that meet minimum size, liquidity and financial viability thresholds. The CSE CEO Rajeeva Bandaranaike speaking at the ceremony commended Vallibel One for making it to the S&P SL 20 index, within a relatively short period of time. He also stated that charismatic and decisive leadership with transformative ideas has enabled Vallibel One to achieve considerable success, where the company has effectively aligned its interests with key growth sectors in the Sri Lankan economy such as Manufacturing, Leisure, Finance and others. Chairman/MD of Vallibel One Dhammika Perera speaking at the event stated that Vallibel One is pleased to have achieved S&P SL 20 status within 7 years of listing the company. He stated that the company aims to achieve further growth across the group, through a focus on cost optimization, implementing international best practices and driving innovation. Chairman/MD Dhammika Perera, Directors Harsha Amarasekera, Sumith Adhihetty, Ms. Kimarli Fernando, Rajan Asirwatham, CEO Ms. Yogadinusha Bhaskaran and other invitees from Vallibel One were present at the ceremony. Directors Anton Godfrey, Dumith Fernando, Dilshan Wirasekara, CEO Rajeeva Bandaranaike and the Senior Management from CSE were also present at the occasion. Market Opening Ceremonies at CSE serve as a platform to generate exposure for listed companies as they celebrate important corporate and capital market milestones. The S&P SL 20 index has been designed in accordance with international practices and standards. All stocks are classified according to the Global Industry Classification Standard (GICS ®), which was co-developed by S&P Dow Jones Indices and MSCI and is widely used by market participants throughout the world.